360 pages, published by the Flame of Love Movement, this Diary was written by a humble woman named Elizabeth Kindelmann, who lived in Hungary from 1913 to 1985. Satan intensifies his efforts to ruin souls. His eternal opponent is the Most Blessed Virgin Mary. She obtained from the heavenly Father, by the merits of the Passion of her Most Holy Son, an outpouring of graces so great as have not existed since the Word became Flesh (the words of our Most Holy Mother). 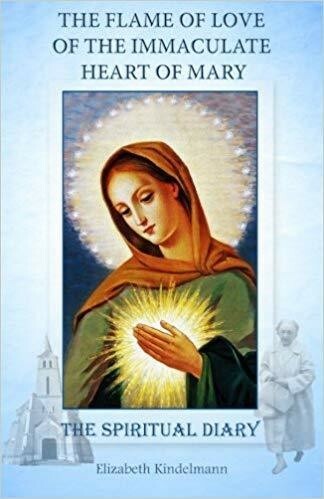 She will blind Satan with the Flame of light and grace which bursts forth from her Immaculate Heart. During the years going from 1961 to 1983, she received heavenly messages and she was directed to put those in writing. It started with an exceedingly "dark night." Following that harrowing event, the Lord Jesus and the Virgin Mary addressed her with internal locutions, words which she heard clearly in her soul. Virgin Mary: "You know how my heart is immensely in pain. Satan is sweeping souls away in a terrifying way. Why do you not all try your best to stop him and do it as soon as possible? I need your help. My heart is burning with sorrow because I see how many souls are being damned. Many are dragged away in spite of their good will. With a sarcastic smile, the Evil One extends his arms, and with terrible malice, he drags away those for whom my Divine Son suffered unspeakable torments and death. Please, help!" On June 6, 2009, a major event took place during the International Convention of the Flame of Love of the Immaculate Heart of Mary in Budapest, Hungary. The original Hungarian Spiritual Diary of Elizabeth Kindelmann received the Imprimatur number 494-4/2009 from Cardinal Péter Erdö, Archbishop of Esztergom-Budapest and Primate of Hungary.